American Airlines is the largest airline in the world. American Airlines operates up to 24 flights a day from the UK to 8 Gateways in the USA with direct flights from London, Birmingham, Manchester, Glasgow and Edinburgh. 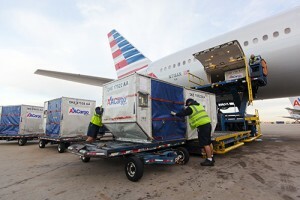 From there, onward connections to 136 destinations in the USA, Canada, Central America, South America and the Caribbean offer an unrivalled network for air cargo.